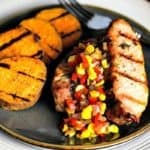 Tender, juicy pork ribs are grilled up with sliced sweet potatoes and garnished with a slightly sweet chow chow mix of corn, onion, sweet bell peppers, and jalapeño. In a small bowl, stir together the rub ingredients. Season the ribs by brushing on all sides with olive oil and then evenly sprinkling with the rub. Cover and let marinate in the refrigerate for 1 hour. Before grilling, allow the ribs to stand at room temperature for 15 - 30 minutes. Preheat grill to medium heat. Brush grates with oil, then place ribs over the direct medium heat, with the lid closed, for 20 to 25 minutes, turning to brown on all sides. Remove from the grill and let the meat rest for 5 minutes. Heat the olive oil in a medium saucepan over medium heat. Add the mustard seeds and cook for about one minute—with the lid on—until they begin to pop. Quickly add the diced onion, red bell pepper, and jalapeño and cook 3-5 minutes until softened, stirring often. Add he remaining Chow Chow ingredients and bring to a boil. Reduce heat and simmer for 8-10 minutes, until the liquid is reduced. Remove from the heat and let cool. Wash and dry the sweet potatoes, then pierce each with a fork several times. Cook the potatoes in a microwave for about 8 minutes or until soft. Allow to cool while the ribs marinate. Cut the cooled sweet potatoes into 1-inch thick slices and brush both sides with oil and season evenly with salt and pepper. When the ribs have finished cooking and are resting, add the sweet potatoes to the grill and cook with the lid closed about 5 minutes, turning once, until lightly browned. Serve the ribs with the sweet potatoes and chow chow. Recipe by Weber, Jamie Purviance.